Californian active hard rock favourites Trapt return Down Under to play highlights from their self-titled classic album Trapt, plus a selection of other favourites. Trapt was the band’s major-label debut; a perfect mix of hard rock with catchy hooks, dynamic choruses, and memorable lyrics. Fusing together propulsive guitars and unforgettable upbeat refrains, the guys are adept at producing empowering arena-worthy anthems. In 2002 ‘Headstrong,’ from Trapt’s self-titled debut, was ranked the #1 alternative song and #8 rock song by Billboard. They were a featured act on Rock Band and Tap Tap Revenge 2, and they also fuelled countless WWE specials. 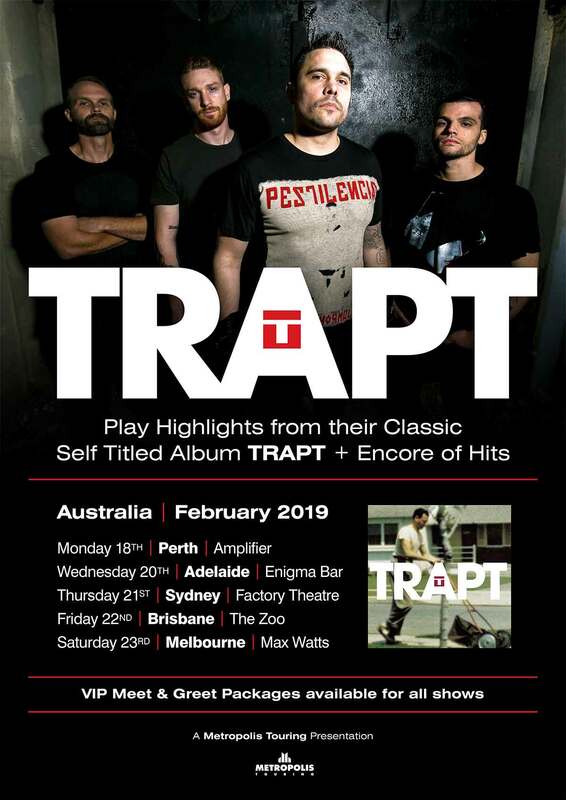 It took until 2017 for Trapt to finally make it to Australia, with sold-out shows in Brisbane, Sydney and Melbourne. Now they’re heading back Down Under to play a string of shows in our major cities.